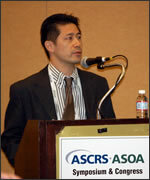 Ouchi M, Panelist． Session 1-L Intraocular Surgery; Phaco Technology, Fluidics．American Society of Cataract Refractive Surgery Symposium and Congress(ASCRS), San Diego,USA,2007.4.28. 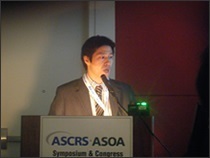 Ouchi M,Kinoshita S: 0.9mm incision Cataract surgery without gas-assisted infusion. 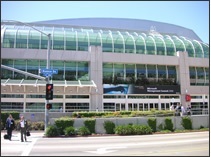 American Society of Cataract Refractive Surgery Symposium and Congress(ASCRS), San Diego,USA,2007.4.30. Ouchi M, Fantasti-sleeve. 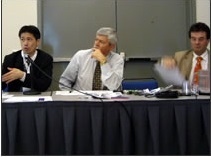 American Society of Cataract Refractive Surgery Symposium and Congress(ASCRS), San Diego,USA,2007.4.30. 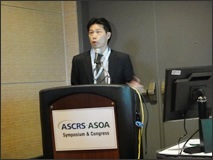 Ouchi M,Hieda O, Kinoshita S: Aberration correcting effect of ThinOptX IOL. 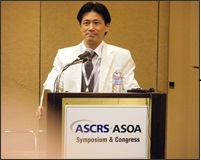 American Society of Cataract Refractive Surgery Symposium and Congress(ASCRS), San Francisco,USA,2006.3.19. 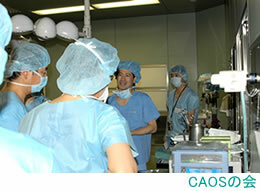 Ouchi M, The knack for Micro Incision Cataract Surgery. 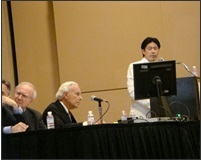 American Society of Cataract Refractive Surgery Symposium and Congress(ASCRS), San Francisco,USA,2006.3.20. 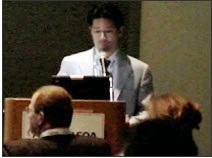 大内雅之：極小切開は本当に必要か、本当に有効か.第3回 ODAIBA Basic Clinical Ophthalmojogy Series，東京，2.18.2006. 大内雅之 : 稗田牧、木下茂：ThinOptX 眼内レンズを用いた完全極小切開手術眼の術後中期成績： 第一報．第29回日本眼科手術学会、東京、1.27．2006. Ouchi M,Ikeda T, Nakamura K, Harino S, Kinoshita S: A novel relation of fatty acid with age-related macular degeneration. Ophthalmologica 216(5): 363-367, 2002. 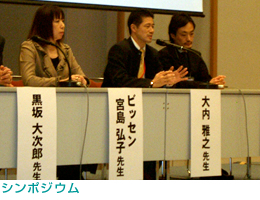 大内雅之：白内障手術の論点：バイマニュアルフェイコ．IOL & RS 24 75-78, 2010. IOL & RS 23 366-370, 2009. 大内雅之：特集　多焦点眼内レンズの実際ー手術の注意点．IOL & RS 22 277-281, 2008. 大内雅之：特集　極小切開対白内障手術ーBimanual Phaco で極小切開手術を行う上での注意点．眼科 48(13)　1901-1907, 2006. 大内雅之：特集　新しい眼内レンズの成績―極小切開対応眼内レンズー．IOL&RS 19(3)　280-285, 2005. 大内雅之：特集　白内障手術―切開創2mmの時代―　さらなる小切開への対応．眼科手術(18)　489-493, 2005. 大内雅之：眼内レンズセミナー220.Rollable 眼内レンズを用いた1.6mm切開創白内障手術.あたらしい眼科 (21)　1651-1652, 2004. 大内雅之：前眼部疾患の診断と治療　眼瞼下垂 眼科ケア 6（8）：745-748 , 2004. 大内雅之：前眼部疾患の診断と治療　屈折矯正手術 眼科ケア 6（7）：657-660 , 2004. 大内雅之：前眼部疾患の診断と治療　開放隅角緑内障 眼科ケア 6（6）：553-556 , 2004. 大内雅之：前眼部疾患の診断と治療　アレルギー性結膜炎 眼科ケア 6（5）：457-460 , 2004. 大内雅之：前眼部疾患の診断と治療　眼窩壁骨折 眼科ケア 6（4）：353-356 , 2004. 大内雅之：前眼部疾患の診断と治療　重症ドライアイ 眼科ケア 6（3）：249-252 , 2004. 大内雅之：前眼部疾患の診断と治療　結膜弛緩症 眼科ケア 6（2）：145-148 , 2004. 大内雅之：前眼部疾患の診断と治療　白内障 眼科ケア 6（1）：49-52 , 2004. 大内雅之：眼底疾患の診断と治療　穿孔性眼外傷 眼科ケア 5：1005-1008 , 2003. 大内雅之：眼底疾患の診断と治療　眼内炎　その１ 眼科ケア 5（9）：813-820, 2003. 大内雅之：眼内レンズセミナー203. 極小切開白内障手術用、新型超音波チップ. あたらしい眼科 (20)　953-954, 2003. 大内雅之：眼底疾患の診断と治療　網膜血管閉塞症　その２ 眼科ケア 5（4）：341-344 , 2003. 大内雅之：眼底疾患の診断と治療　網膜血管閉塞症　その１ 眼科ケア 5（3）： 237-240, 2003. 大内雅之：眼底疾患の診断と治療　加齢黄斑変性症　その１ 眼科ケア 4（9）：857-860,2002. 大内雅之：眼底疾患の診断と治療　網膜剥離　その３ 眼科ケア 4（8）：764-767,2002. 大内雅之：眼底疾患の診断と治療　網膜剥離　その１ 眼科ケア 4（6）：565-568,2002. 大内雅之：眼底疾患の診断と治療　糖尿病網膜症　その２ 眼科ケア 4（3）：239-242,2002. 大内雅之：眼底疾患の診断と治療　糖尿病網膜症 その１ 眼科ケア 4（1）：44-47,2002. 大内雅之：極小切開対応眼内レンズ HOYA C-60Hの早期臨床成績．IOL & RS 22(1) 67-72、2008. 大内雅之, 木下茂：新しい超音波チップと灌流チョッパーを用いた極小切開白内障手術. IOL&RS眼科ケア 18（2）：143-146, 2004. 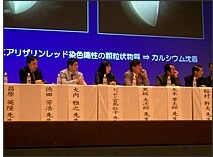 大内雅之, 安原徹, 小泉閑, 澤浩, 池田恒彦, 木下茂：網膜下出血を伴う増殖糖尿病網膜症の臨床的特徴．日本眼科紀要 49(7)：592-596,1998. 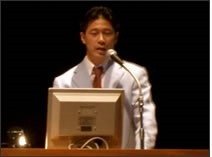 大内雅之, 池田恒彦：網膜下出血を伴う増殖糖尿病網膜症の検討．公立南丹病院医学雑誌 1 (1)：91-95, 1997. 大内雅之：特集　多焦点眼内レンズの実際ー手術の注意点．IOL & RS 22 277-281,2008.